How much is Rey Mysterio Worth? 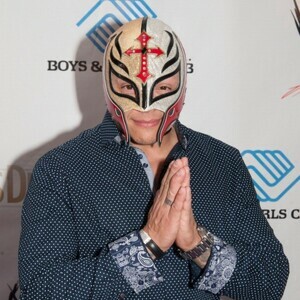 Rey Mysterio net worth and salary: High-flying luchador Rey Mysterio has a net worth of $10 million. And he didn't accumulate his net worth in a cushy acting job, memorizing lines and spitting them out. No, he earned it in the highly physically perilous world of professional wrestling. Beginning his career in his native Mexico when he was only 15 years old, his star continually rose until he signed with American wrestling circuit ECW in 1995, at the age of 26. Soon after, it was the big time for Rey Mysterio, making his World Championship Wrestling debut just a year later in 1996. It was here that Mysterio's high-flying style first earned him serious American fame. It was also during his career at WCW that Mysterio first took off his famous mask and revealed his face to the world (as the result of a "hair vs. mask" match between him and Kevin Nash). He was against taking off his mask, but was forced to by WCW management. It didn't seem to hurt his career though, as his stock among wrestling fans continued to go nowhere but up. After the collapse of WCW, Mysterio found himself working for his formal rivals at WWE, where he continues to be a fan-favorite now and into the future.